On a fine Saturday Oct month, myself and the housemate(TH) decided to go out for lunch. When he suggested a Full Buffet in Accord Metropolitan I gave a long look. That look had at least 100 meanings in it :-). But no guy can completely decipher a woman's thoughts. Right???. Well, one inference that the housemate got from my glance was that month being Purattasi, non veg was a complete no-no to us. So if non-veg options are curfew-ed, then I was not the one to spend a few hundred bucks on a veg buffet. My hubby was also against it. So both were quickly suggesting some veg outlets. I suggested (Pizza) --- TH (oh no not for a Saturday lunch), He (Saravana Bhavan) --- Me (again a scornful look), I (Rajdhani) -- TH (he was interested in the huge platter they serve and was ok-ok). I told him to check if there are any other outlets apart from the one in Phoenix Mall, Chennai. He started checking it over web and stumbled upon something which he initially didn't reveal to me. He mentioned we are going to RA Puram and I heard it as Arya Gowda Road😆. I was wondering is there a restaurant in Arya Gowda road as I'm cognizant of this area and the nearby shops. So after a brief ride, I understood that he is taking me to some other place. I started pestering him with my usual questions "where are we going". He asked me to be blind and just accompany him. After a quick ride for 15 minutes we reached "Cafe Nirvana". 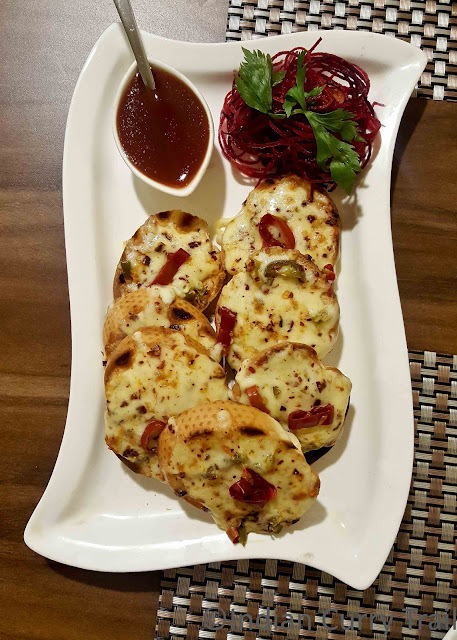 It is a vegetarian restaurant situated on the Chamiers Road in Alwarpet/ RA Puram area. Well, the board is not easily recognizable due to the tall trees on the road. Luckily TH was driving the car slowly. It is just a few yards from the Velveteen Rabbit Pub & Restaurant on the Chamiers Road. There is limited parking space available for the Cafe Nirvana restaurant. 2 or 3 cars can be parked and the rest have to be parked along the kerb. but good thing is that they do valet parking. The restaurant sits on the 1st floor. There is a ATM downstairs.There is no lift but stairs are comfortable to take. 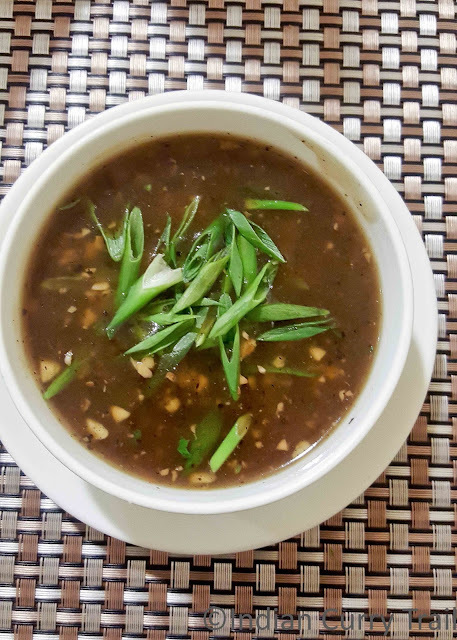 As I entered the restaurant, I found the ambiance to be simple and good. The restaurant was spacious and decent. We were asked to wait for few minutes and were taken to an enclosure inside (meant for exclusive family dining or small party, I guess). We were greeted by the waiters and were given the menu card to choose from. The menu card was clamped to a board which resembled like a cutting board to me👸. I started going through the menu and asked the usual question of what TH is going to order. The discussion with him went for few minutes and waiters had waited till we decide on the food from menu card. TH started with Soup of the Day. Asked the waiter what was the variety for that day and it was Hot Pepper and I too got interested. Hubby asked the waiter to make it 1/2 and the waiter obliged kindly. 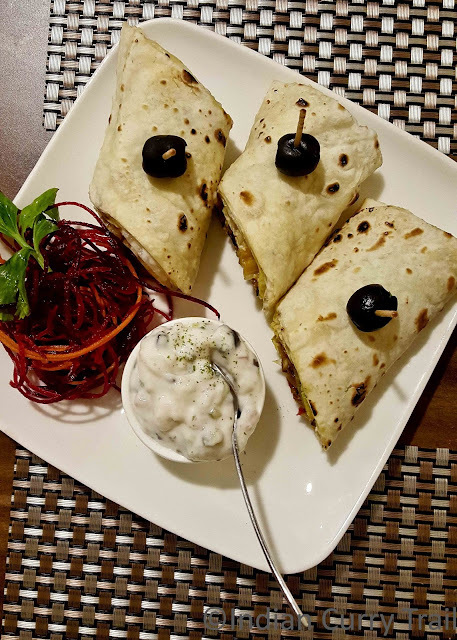 TH ordered a Paneer dish - Paneer has become synonymous with desi vegetarian folks and also for TH. The dish he ordered was "Deggi Mirchi Paneer Tikka". I don't remember a day he hadn't order any paneer dish in any of our dine-outs. I topped up the order with two more starters “BBQ Bell Pepper & Cottage Cheese Wrap“ and “Jamaican Jerk Chilli Cheese Toast”. 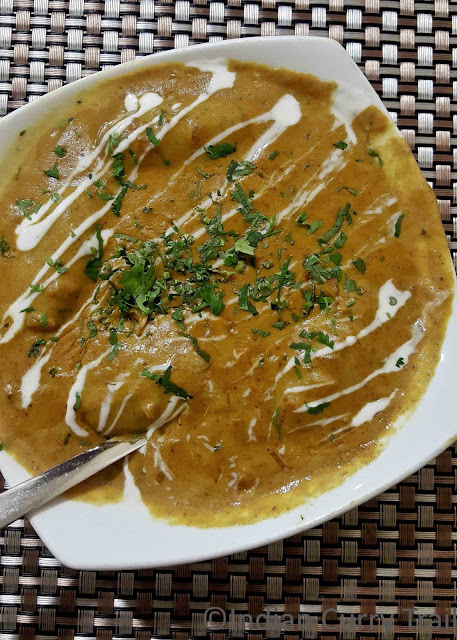 While him and me were relishing the Soup, the 1st starter "Deggi Mirchi Paneer Tikka” came at the right time. 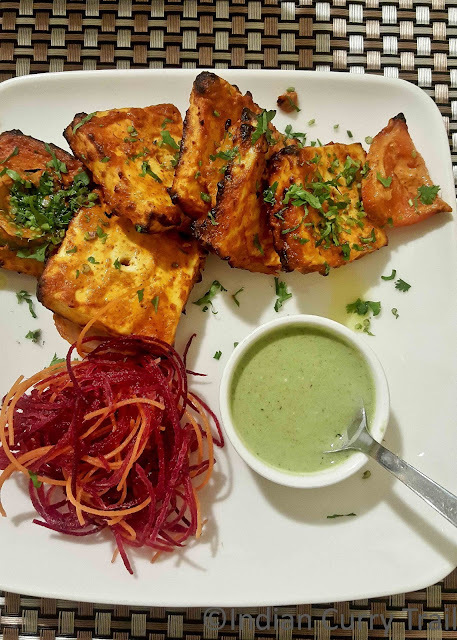 The Paneer was soft and cut into nice square cubes and garnished with herbs. It tasted yummy. The “Jamaican Jerk Chilli Cheese Toast” and “BBQ Bell Pepper & Cottage Cheese Wrap” came swiftly one after the other. The Jerk Chilli was an absolute delight – not too spicy not too bland – just the right mix. The Cottage Cheese wrap was ok-ok. Nothing great about it. The one thing which was common in all the plates was a beetroot noodles which was simply attracting and nice to eat as well. For the main dish, he ordered one of his old favorite “Kashmiri Naan” and to go with this sweet naan he ordered spicy “Subzi Kofta Curry”. 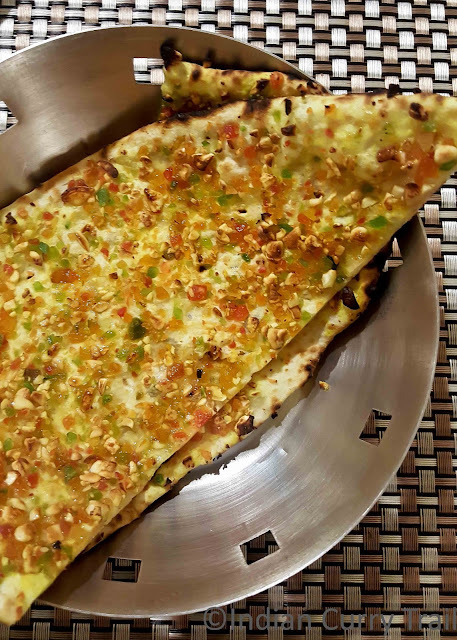 He didn’t have Kashmiri Naan for a very long time and when it was available on the menu, he quickly checked with the waiter if its available. Since my tummy was already full with the delightful starters, I didn’t go for a separate main dish and just asked the waiter to bring one more Kashmiri Naan. The Naan was great topped with dry fruits in abundance. The Naan was not too oily and was cooked to the right level. The Naan went well with the spicy Subzi and we really enjoyed the dish. 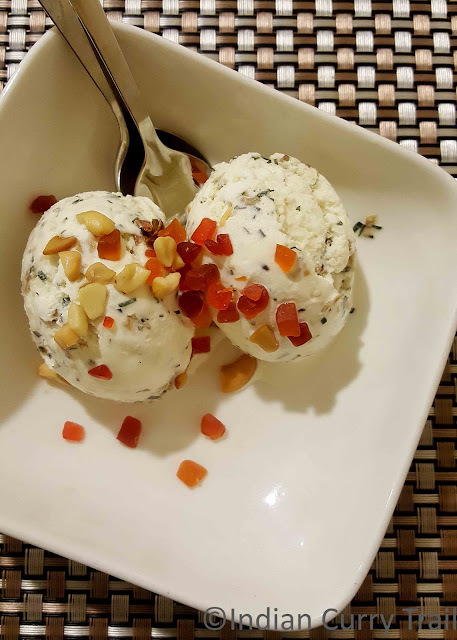 Both our tummies were full but still we were interested to try the “Paan Icecream”. We ordered one and shared it between us. The ice cream was heavenly and it signed off a well-fed lunch. He asked for the bill and it was not high considering the quality of dishes served. 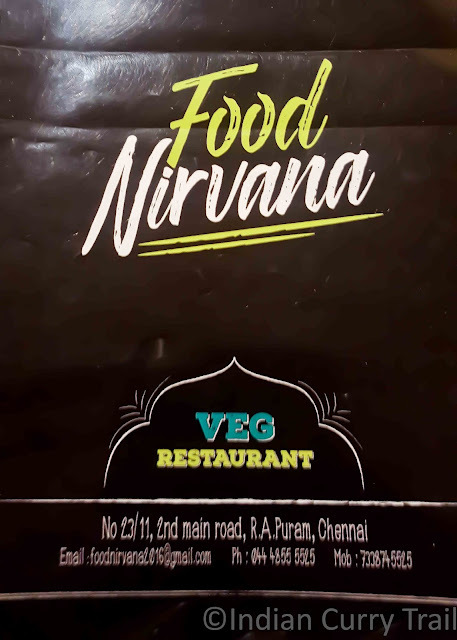 I would recommend “Café Nirvana” to any veggie lover who wanted to try slightly different but still not too offbeat. Happy Eating! Disclaimer: This is not a paid review and opinions are truly mine.